Verne Troyer is the 2’8″ tall actor who became a star after playing Mini-Me, the tiny alter-ego to Doctor Evil in the comedy features Austin Powers: The Spy Who Shagged Me (1999) and Austin Powers in Goldmember (2002). Verne Troyer was born in Michigan, and his short stature was the result of a rare genetic disorder called Cartilage–hair hypoplasia (CHH). Troyer graduated from Centreville (MI) High School in 1987, and his Hollywood career began somewhat by chance in 1994, when he was hired as a stunt double for the nine-month-old character Baby Bink in the film Baby’s Day Out. 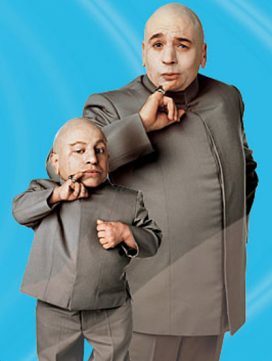 That led to other stunt and acting parts before landing his role as Mini-Me. The role made Troyer a minor celebrity. He appeared often at movie premieres and public events, and made a popular 2003 commercial for Apple computers with 7’6″ basketball star Yao Ming. Over time he had other small roles: he played the goblin Griphook in Harry Potter and the Sorcerer’s Stone (2001, with Daniel Radcliffe), Coach Punch Cherkov in The Love Guru (2008, also starring Mike Myers) and Percy in the fantastical feature The Imaginarium of Doctor Parnassus (2009, directed by Terry Gilliam). At his death his last film was still in post-production: he played Emperor Beezel-Chugg in the comedy sci-fi film Hipsters, Gangsters, Aliens and Geeks.